The brand new release OrangeA Power Tower is a solid and sturdy fitness unit with a standing tower, sit up station, dip station, vertical knee raise station (abdominals/core), push up station (chest, abs, back), chin up, multi-grip pull-up station (arm strength) for indoor home gym use. As a robust product with a proper oblate reinforced stainless steel frame, you can have a maximum load weight of up to 550 pounds. It has a conveniently folding design and is adjustable for height between 55 and 88 inches (two height positions to accommodate different needs). OrangeA Power Tower is quite a versatile product that lets you do dips, leg raises, pull ups, push ups, different dumbbell exercises. The nicely padded arm and back support sewn vinyl cushions ensure comfy exercise sessions. It has the anti-slip grips on PP handles and a sturdy base with the 4mm thick bottom tube and the anti-slip grips on the feet. There are dual round bars at the base of the power tower and you’ll see the handles on them, which you can use comfortably for push-ups. 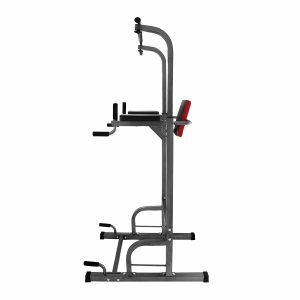 You can do a variety of exercises on this unit- comfortably work on your chest, shoulders, arms, back, legs and core section. You will literally work each muscle on every part of your body for a great total body workout. There are two vertical training arms and you can do your leg raises by using the folded bench as the backrest and the arm cushions for comfort and support. By using the horizontal arms just below and the front of these two padded cushions and underneath the vertical arms, you can perform your dips. You can easily insert a barbell into the two dumbbell holders (the two-stage adjustable barbell rest) and there is a training bench for you to do your bench presses comfortably. Black OrangeA Power Tower weighs 112 pounds in total and measures 39 x 26 x 90 inches, while the bench has the dimensions of 40.5 x 11.8 x 1.7 inches. You can conveniently fold it into a vertical position to be able to save up some space in your room. OrangeA Tower is a great all-in-one resistance training unit that you will enjoy doing your bench press, pull-ups, push-ups, dips, leg raises and more on. So you do not have to purchase different products for working on different parts of your body- saving yourself some money and space. It is sent unassembled but is reported to be put together easily. The cushion on the arms and the backrest are not the best quality but OK and you may replace them easily if you need to. This is a good product overall, especially for the price level.